Embracing Life, the latest from The Studio and my disaster…. Went up to Ridgeway Moulding and Casting yesterday to see Laura and to pick up and drop off my latest pieces…. It’s always an exciting trip – full of anticipation about how the latest sculptures have turned out. Also it’s great to discuss finishes / patination and mounting for new work – these areas are critical in maximising the impact of your sculpture – what are you trying to say and how can this message be amplified or enhanced? This time it was even more exciting because I was dropping off my latest dog portrait to my client – about which more on a future blog (it’s a birthday present and won’t be presented until the big day). That said, there were tears – always a good sign (I think?). 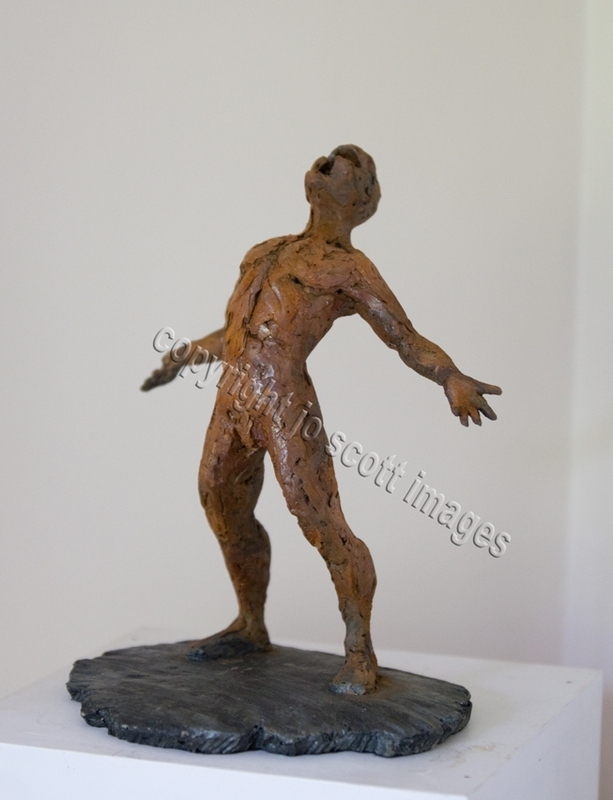 I’m incredibly chuffed with my Embracing Life sculpture which looks so cool in cold cast iron with slate base. I blogged about how this figurative sculpture was inspired by my Dad and his amazing tenacity – if you’re interested it’s the Blenheim post. I also collected a body cast which I did for a client. It’s again a birthday present and is for the father of the three girls whose hands I cast using alginate and plaster. 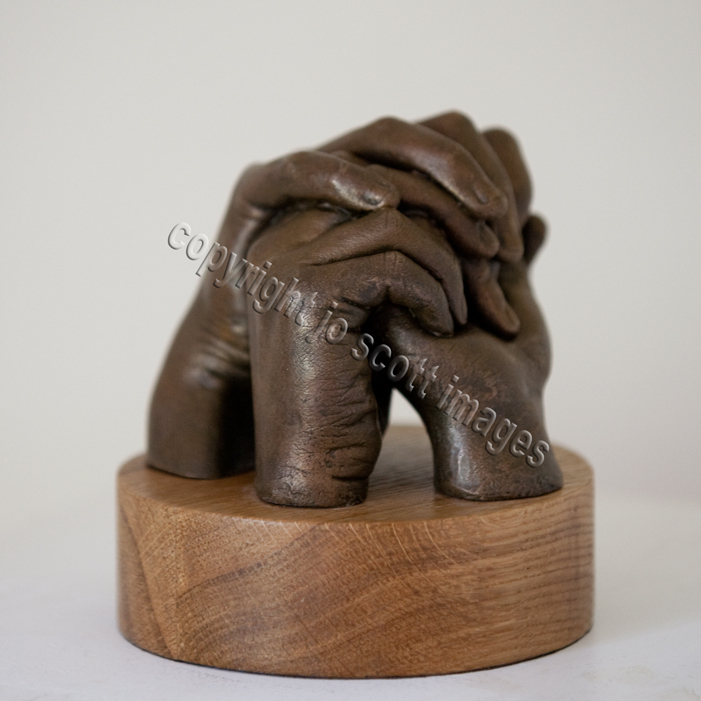 Looks great in cold cast bronze on an oak plinth. I was also meant to be dropping off my latest head portrait – but sadly no. Had a complete disaster on Friday. I recently attended a master class with Brian Taylor and the Society of Portrait Sculptors at Heatherleys in Chelsea. It was really fab as Brian is a relative god amongst portrait sculptors. His son was our model and with his ‘punky’ hair and piercings was a brilliant contemporary subject. Anyway, back to the disaster – I was just putting the finishing touches to his eyes in my own studio when I decided to raise the height of the stand – Yup, you’ve got it……. head plant right onto the floor – face first so sculpture totally ruined! This entry was posted in abstract sculpture, animal sculpture, body cast, dog portrait, figurative sculpture, gary scott blog, hand portrait, sculpture blog and tagged animal sculpture, dog portrait, figurative sculpture, gary scott, gary scott sculptor, gary scott sculpture, hand portrait. Bookmark the permalink. 1 Response to Embracing Life, the latest from The Studio and my disaster…. Can I first of all thank as well as congratulate you for being my 250th follower on Twitter! That’s a fantastic milestone for us both, coming especially from a sculptor whose work is among the best I’ve seen for as long as I’ve been on-line. I read some of the script on your website, but before I did, I thought to myself “I see a touch of Rodin here”, going by the coarseness of the surface texture in your works. I do still see, however that you have excellent ideas of your own as well, and however much you have been influenced by such great sculptors as Rodin, that does not take away the excellence of your own talent. One of my Spanish followers got in touch with me tonight, and I told him a similar thing to you – that his paintings reminded me of Picasso’s early works, and he is an excellent artist. Like his, your website is one I will keep looking at. I would like to congratulate you also for the career you made out of your talent, and I would like to see more of it. Thanks ever so much for following and welcome to my art world.